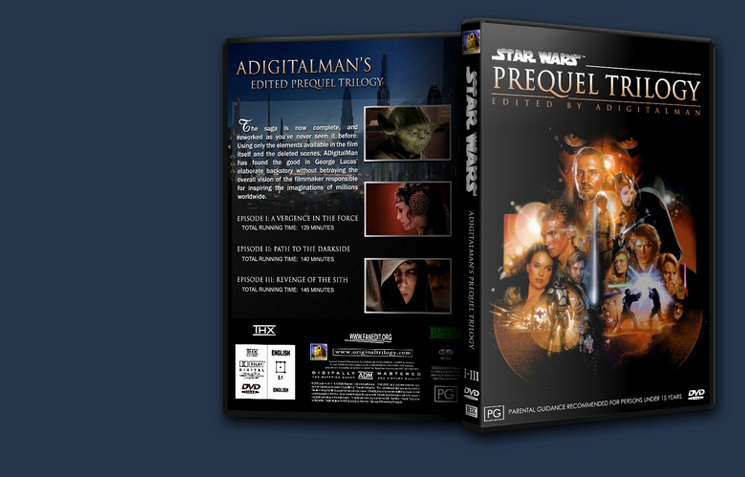 This removes the most offensive parts from the second prequel and turns it into a better movie. A lot of is gone and the overall awkwardness drastically reduced. 1. New episode name "Path to the Dark Side"
* Padme's parents house. It is important to note that this is not incongruous with Padme ascending to the throne at such an early age. Even in the unedited scene, nowhere does Padme introduce the man as her father. It is assumed that the Queen Mum is now remarried. * Obi-Wan and Mace in the Jedi Hangar (The similar scene with Yoda has been removed). 4. References to Amidala as a senator have been removed. Amidala is still Queen of Naboo, and she has focused on leading the opposition to the Galactic Senate's Military Creation Act. It is intimated that Jar Jar is actually the Senator from Naboo. All references to Queen Jamilla have been removed. 5. Zam's subplot of being a changeling is removed because it went nowhere. The Kamino Saber Dart thus becomes that much more lethal a weapon, based on the instant mummification effect it has on Zam. * Some of Anakin's dialogue during the speeder chase. His actions are deliberate now. * "At least we have Artoo with us ... (laughter)"
* "I hate sand ..."
* "I'm a Jedi ... I know I'm better than this." * Anakin pouring his heart out to Padme in front of the fire. This has been trimmed down to a more effective speech, helping to show the tension they both feel. It's clear that there is romantic tension between the two of them without this dreadfully awful soliloquy. * Beautiful, especially for a Senator, etc etc. * "It's not fair ..."
* Riding around on that big tick thing in the field and rolling around in the heather with Padme. * Shots of his dream about his mother are inserted into his nightmare sequence to break up the awkwardness of this shot without losing its purpose. Doesn't quite look like he's jerking off in bed to thoughts of his mother anymore. 8. The Geonosian Archdukes's subtitles have been rewritten for effectiveness and faster reading. Pretty horrible movie, why u no cut more out? New dream scene was a unique dafuq moment. Audio/Video Quality: Something similar to the first episode made by adigitalman happens here. The quality is good but not enough if we compare it with the Blu-Ray new editions that can be bought everywhere. 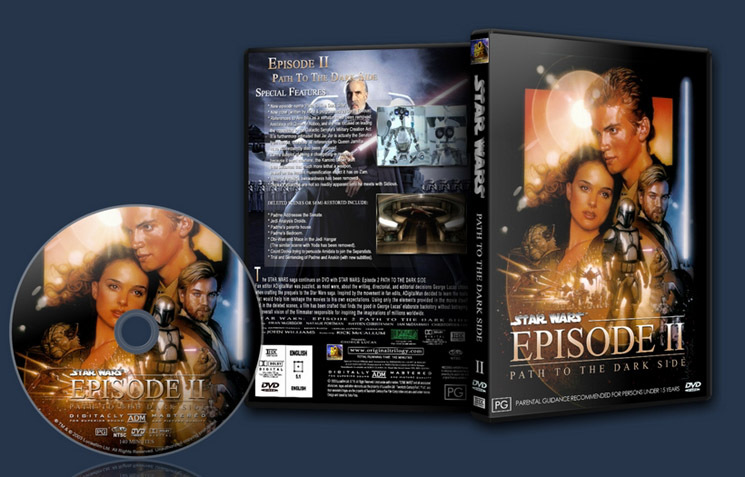 Visual Editing: A lot of cuts were made in this movie although a lot of new extra deleted scenes were introduced, hence the similar duration between the original one and this edition. Some are not very polished. Audio Editing: Like in the first part, a lot of the changes made cut out sentences that the character do not say anymore. However I feel some cuts could have been made, specially when the movie is near to an end. Narrative: The narrative is changed a little but nothing very impressive. I did like the scenes where we get to know a little more about Amidala's private life, because they add something different, lost in the originals. Enjoyment: The sensantion after watching this movie is in general terms good. 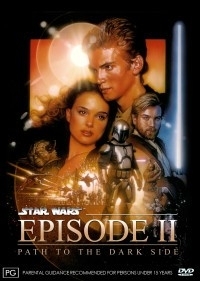 Anakin does not seem so childish until the end of the movie where I believe something more could have been done but it is ok.
firstly, the switch from Padme going to bed to having Obi-Wan and Anakin running into the bar on Coruscant looking for the would-be assassin is way to abrupt. Without the assassination attempt or the chase scene, it makes the search for the maker’s of the dart confusing. secondly, you need to decide on one scene that portrays Obi-Wan expressing his concerns to Yoda or Mace Windu on whether or not Anakin is ready for his first assignment. Because Mace Windu is present in both scenes, it makes Obi-Wan look like a broken record saying the same things twice. it’s a pity for the deleted scenes, George Lucas didn’t add the final details of the CGI, but that is beyond your control. You made the transitions between those scenes very smooth.